What a way to serve wine! 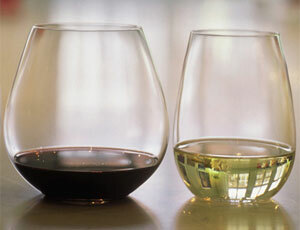 Stemless glasses are extremely popular and are favoured against traditional stemmed glasses for some people. The innovative and easy-to-hold design appeals to wine lovers and enthusiasts alike. However this glass does cause commotion within the wine industry, being the centre of many discussions of appropriate glassware (stemmed vs. stemless glasses). Although you may have used stemmed glasses for years, perhaps now is the perfect chance to try or start using stemless glassware. Which wine is best for a stemless glass? We have produced the table below as a guide to serving red and white wine in stemless glasses. After numerous tests and investigations, we have found these are our favourite wines to serve in stemless glasses. Flavours and aromas of each wine are beautifully explored in stemless glassware. This table can be a useful reference for dinner parties or entertaining. Shiraz Serve alongside a mouth-watering sirloin steak dinner (and all the accompaniments). Cabernet Sauvignon Cabernet Sauvignon is ideal for serving alongside any meal using lamb or beef. Bordeaux Gorgonzola is the perfect cheese to pair with a glass of Bordeaux. Magnificent! Rosé Rosé is the perfect drink with any seafood or fish meal. Viognier Viognier can be enjoyed and served alongside canapés and vol-au-vents. Perfect for a small dinner party. Stemless glasses are easy to store. They are perfect for large gatherings or parties. These glasses are extremely suitable for red wine and are also suitable for a wide range of other drinks including water, white wine and soft drinks. Wineware Tip: If you are hosting a tasting evening black stemless glasses completely conceal wine, so your guests will be unable to distinguish the contents making the evening even more exiting and challenging. Stemless tasting glasses offer a unique approach to tasting in comparison to the traditionally used, industry-standard ISO Type Wine Tasting Glass. What Temperature should wine be served in stemless glasses? We have created a Suggested Wine Drinking Temperatures chart (PDF) to help you know the optimal temperatures to serve wine. Please feel free to print this table and use it as a guide. If you would like us to add any other wines or serving suggestions to our stemless glass chart then please let us know your suggestions via email or on our Twitter page. We want wine lovers and enthusiasts to also be honest, if you are not a fan or user of stemless glasses then let us know why! Our stemless range may just convince you otherwise. All that is left now is for you to pour yourself a nice glass of wine into a beautifully crafted stemless glass!